With the absence of Ruidiaz for the second straight week hanging over the Sounders starting XI like a pesky cumulonimbus cloud, Will Bruin came up huge bagging two goals as Seattle defeated Toronto 3-2 on Saturday. 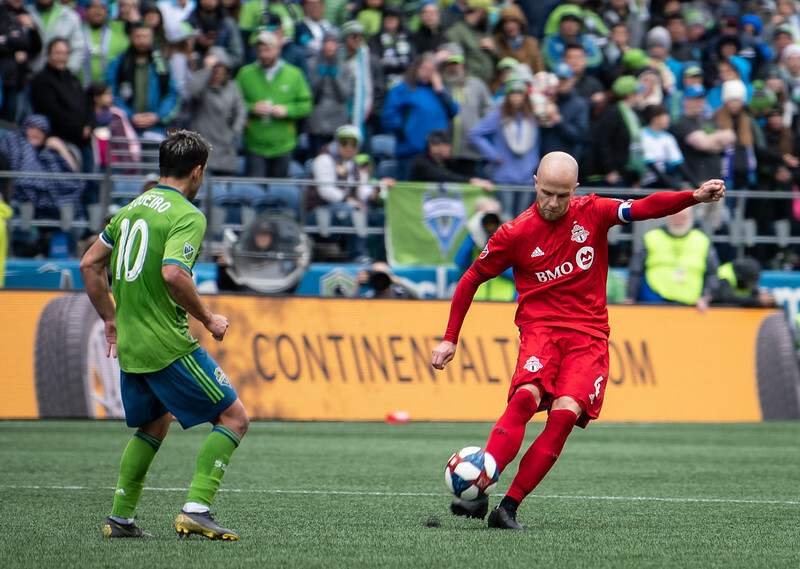 Toronto rolled in to CenturyLink Field missing two of their starting defenders and starting goalkeeper, but with two of the highest paid DPs in MLS in Jozy Altidore (5m) and Michael Bradley (6.5m) and the most talked about early season signing, Alejandro Pozuelo. Toronto and the Sounders are old friends at this point having split the success of two MLS Cups and showing no love lost after either of those games. 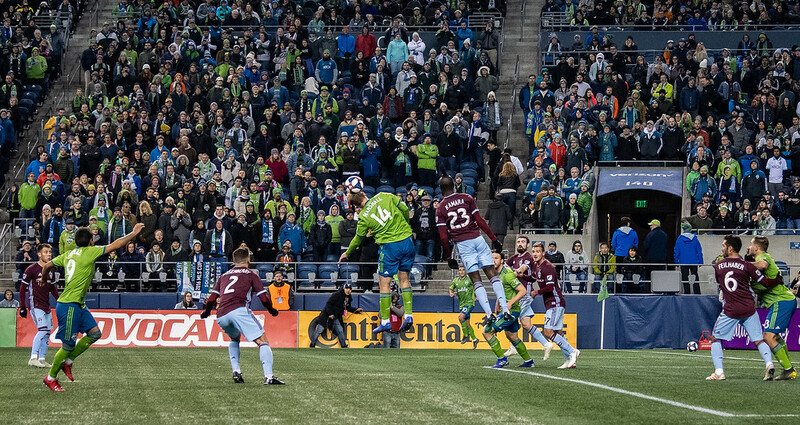 Nearly 38,000 (another turnout on the lower end for the Sounders) turned out Saturday afternoon to watch the Sounders beat their old MLS Cup rivals off of a Will Bruin brace and a rocket by Cristian Roldan. The game got off to a disappointing start for Seattle, who saw a wide open Jozy Altidore head home a cross from Pozuelo in the 13th minute. The crowd grew silent, aside from boos for the former/occasional US National Team striker. In the 24th minute, much to the joy of the Sounders faithful, Bruin slotted home a diving hider off a deflected cross from Brad Smith to bring Seattle even at 1-1. Starting the second half still deadlocked, Seattle found the advantage of possession and offensive pressure. In the 66th minute, the pressure paid off as Bruin knocked in another cross from Smith to put Seattle up 2-1. Two minutes later, Cristian Roldan roofed a laser finish to give the Sounders a two goal cushion of 3-1. Not to be quieted easily, Altidore and Pozuelo connected once more in the 70th minute to give Toronto their second and final goal, ending the game 3-2. 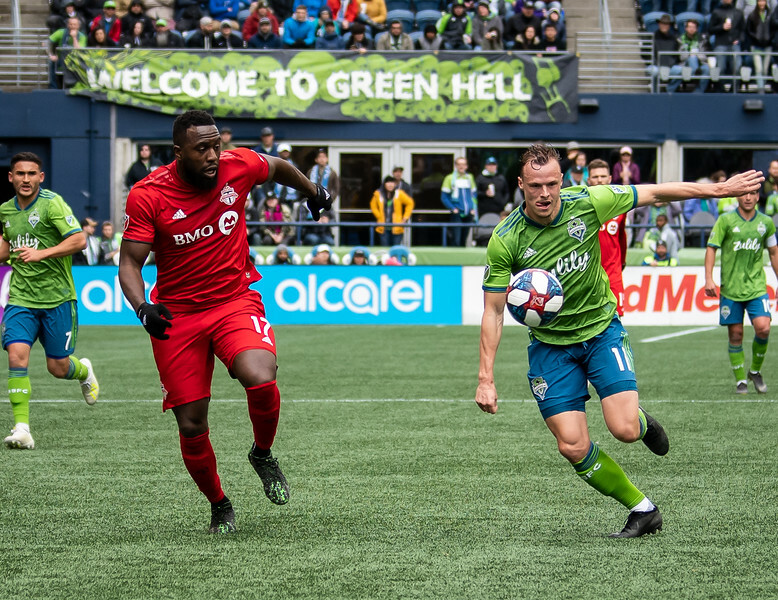 Toronto came in to CenturyLink undefeated and left with their first loss, but they were only the first of two undefeated teams the Sounders will face in April. Thanks to the genius that is MLS scheduling, Seattle faces LAFC two times in seven days both home and away. The Black and Gold have been extremely dominant to begin the 2019 season and are the only team ahead of Seattle in the Western Conference. They also feature a star forward named Carlos Vela, who has been tearing teams apart all across the country the past month and shows no sign of slowing down. Bob Bradley has his team playing just how he’d like, except for a few injuries, and the results have been undeniably dominant. While the Sounders survived TFC at home, facing LAFC two times in seven days will be a real test. But he’s contributing both offensively and defensively like no other left-back in the league right now. A healthy Brad Smith could be just the key the Sounders need to make a solid postseason run. It was El Capitan to the rescue once again in Seattle. 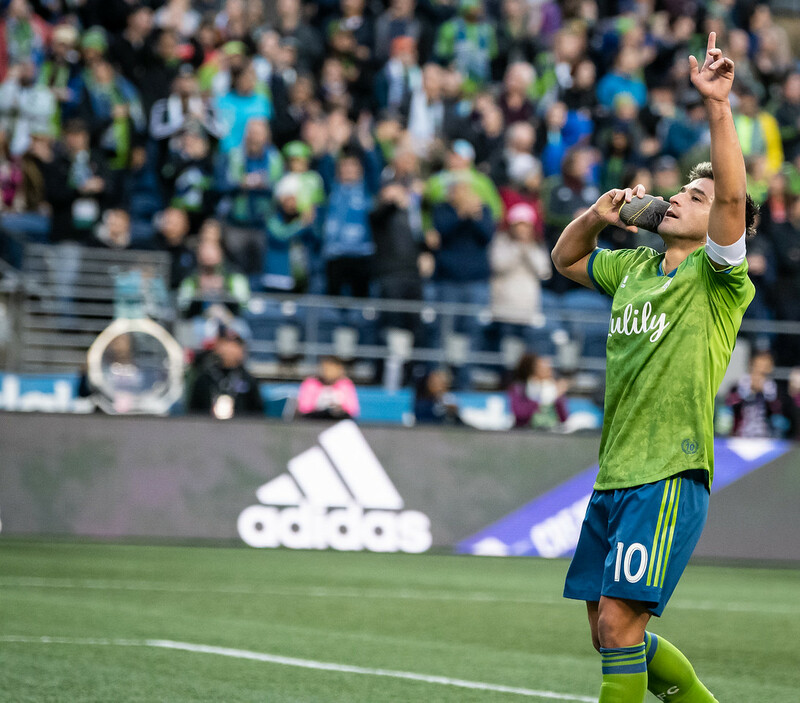 Nicolas Lodeiro bagged the only goal of the game early in the first half to give the Seattle Sounders a 1-0 win at home over Western Conference rival, Real Salt Lake. 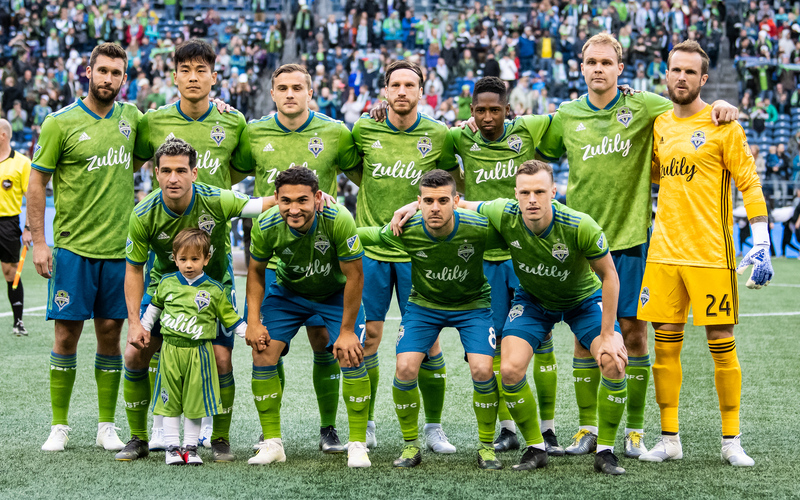 The Sounders started the game with a lineup adjustment as Raul Ruidiaz was held out of the 18 due to a knock he sustained in the Vancouver game the previous week. Ruidiaz had been limited in training and head coach Brian Schmetzer had stated he would be a game-time decision. However, with 3 games on the schedule in only a 6-day span, Ruidiaz clearly needed the rest. MLS veteran (and new dad!) Will Bruin replaced Ruidiaz; he put in a solid shift frustrating the RSL defenders and contributing great give-and-go plays with his teammates. were shouted in the 10th minute after Rodriguez was taken down heavily, but referee Nima Saghafi would not be swayed. After 18 minutes of consistent attacking, it was the captain, Nicolas Lodeiro, who scored an absolute stunner with a thunderous volley that flew past Nick Rimando. Cristian Roldan also grabbed his first assist of the year on the service to Lodeiro. No highlight reel efforts graced either team the remainder of the game, and the Sounders held on to their 1-0 lead at home. They remain unbeaten as they prepare to face the Colorado Rapids on the road this Wednesday before greeting old MLS Cup rivals, Toronto FC, back at CenturyLink on Saturday, April 13 at 1 p.m.
Another road game followed by a tough home match-up will be a solid test for the Sounders, especially with Ruidiaz’s status unclear and Victor Rodriguez being subbed relatively early the past few games as a precaution. With 13 points out of a possible 15 so far this season, the Sounders will definitely be pushing to continue building on their best start in franchise history. The Seattle Sounders rolled in to Chicago just as hot as they’d started at home. From the opening whistle, the Sounders were firing on all cylinders down both wings and through the middle with Nicolas Lodiero. The first goal came in only the 8th minute when Victor Rodriguez found the back of the net from an insanely accurate cross from Jordan Morris. The 1-0 lead was doubled in the 15th minute when Morris chipped Chicago goalkeeper David Ousted with the outside of his right foot. The finish was just as highlight-reel-worthy as the ball in from Nicolas Lodiero. 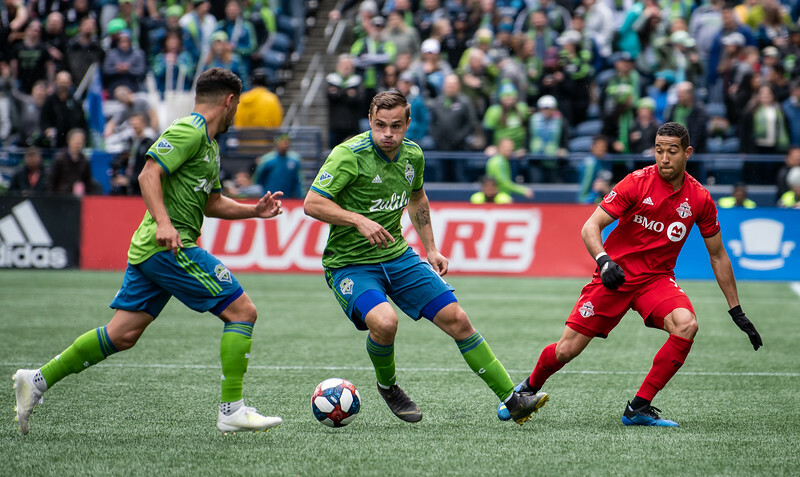 The Sounders returned to the field in the second half with a clear offensive push that showed they were not content with only 2 goals. Rodriguez drew a penalty after a hard take-down and el capitan, Lodiero, placed the ball on the spot. 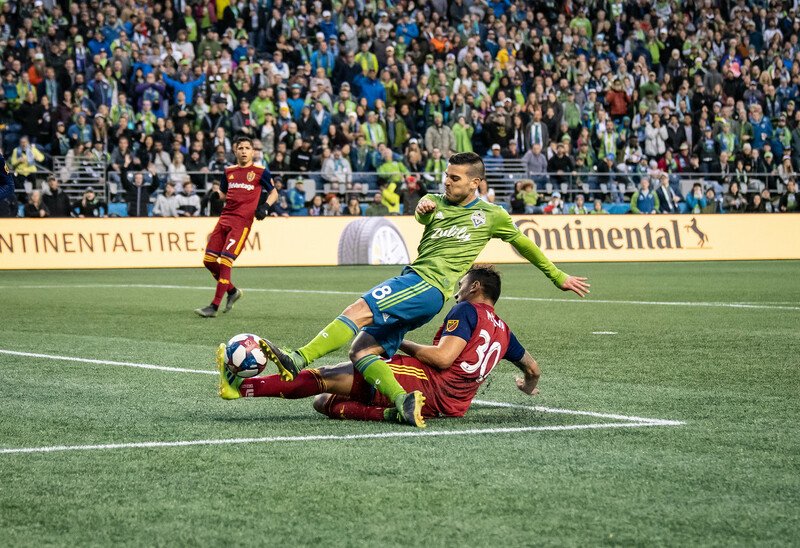 While the initial kick seemed to have hit the woodwork, the shot hit the crossbar and bounced down crossing the goal line, giving Nico his first goal of the season and increasing the Sounders’ lead to 3-0. Minutes later, Raheem Edwards, a first half substitute, pulled one back in the 56th minute. The two teams battled for the next 30 minutes and Fabian Herbers made things interesting in the 84th when he scored a second goal for Chicago making it 3-2 Seattle. Raul Ruidiaz came to Seattle’s rescue, however, and tallied his third of the season in the 88th minute to make the final score 4-2 in favor of Seattle. There was so much speculation and excitement surrounding Jordan Morris’ return to soccer. After more than a year out with injury, there was still a good deal of skepticism even after his dominating performance in the home opener. For whatever doubters might still be lingering, his goal and play this game showed that the hometown kid is back and better than ever. Morris left Chicago to join Gregg Berhalter and the US Men’s National Team in Orlando where he’s hoping to spark a comeback in the stars and stripes as well. The front four of the Sounders were at it again from the opening whistle until each (excluding Ruidiaz) were subbed off. The dynamic tandem on the left side with Brad Smith and Victor Rodriguez was an issue early on for Chicago, as it was for Cincinnati and Colorado previously in the season. Kelvin Leerdam had another open look at goal, Morris and Lodiero put on a show of skill and Ruidiaz scored a goal in his 8th consecutive MLS game. Stefan Frei was called upon a few too many times this game, although he rose to the occasion for many of them. The Fire put up 25 shots and 12 on target and maintained 52% possession during the game. While the Sounders still secured a solid 3 points on the road, it wasn’t their cleanest victory. 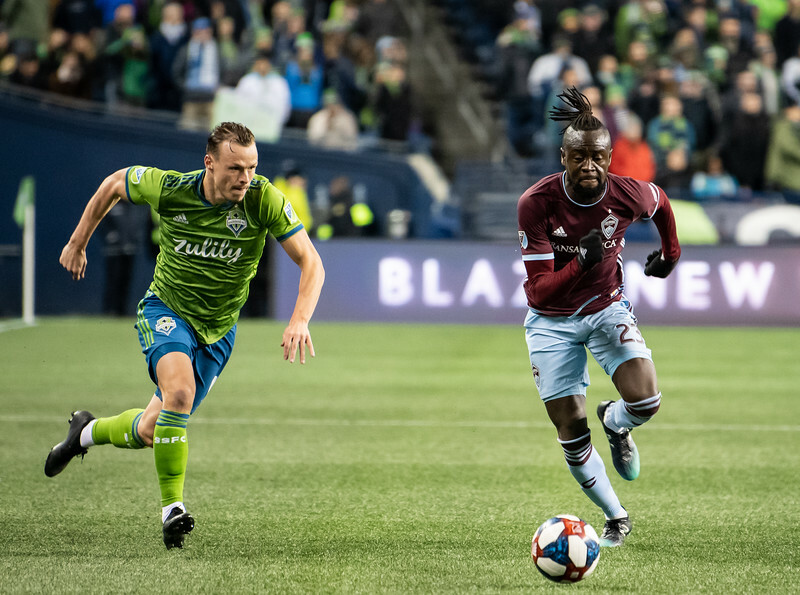 While the 2-0 lead is the most dangerous lead in soccer, the Seattle Sounders were able to hold off the Colorado Rapids for over 80 minutes at CenturyLink Field Saturday after scoring 2 goals in less than 10 minutes. While it was a shock to some and a joy to all, Kelvin Leerdam notched the opening goal for the second week in a row. In the fifth minute, Brad Smith sent a cross in to the box that created a mad dash of ricochets and poor clearances. Leerdam somehow ended up with the ball at his feet and hammered home a left-footed beauty that sailed past the Colorado keeper, Tim Howard. In the 8th minute, Raul Ruidiaz smashed home his second goal of the season by finishing off a stellar cross from Victor Rodriguez. The Sounders have notoriously played catch-up their past few seasons, including their back-to-back appearances in the MLS Cup Final. With Leerdam and Ruidiaz both notching their second goals of the season and Morris bagging a brace the previous game, the Sounders now have three players with more than one goal. Last season, the Sounders did not have more than one player with multiple goals until June. The victory on the night also signifies the Sounders first 2-0 start to a season since 2015. While it’s definitely early, the team is certainly making a statement. While Stefan Frei wasn’t truly tested during the match, the backline and goalkeeper looked seriously solid while putting up a clean sheet. Brad Smith and Victor Rodriguez show signs of being an increasingly powerful wing combo, producing multiple strong runs and overlaps throughout the game. 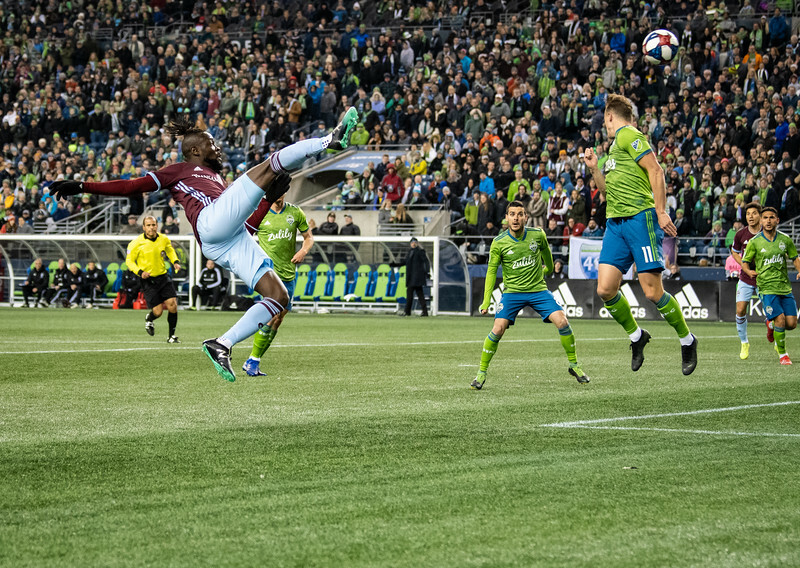 Leerdam’s ability to contribute goals is something he has accomplished at previous clubs and is a welcome change from the usually predominant defensive role he has played with the Sounders. After two dominant performances at home, the Sounders now travel to Chicago next Saturday (3/16) and Vancouver at the end of the month (3/30), following a bye-week during International Friendlies. The road games will be a true test for the team who has always performed better at home.